I listen to audiobooks at virtually every free moment. Walking Piglet, cooking, out for a run, tidying the house (ha… that doesn’t take long! ), driving etc, and very quickly after starting to do so I ran out of the ones I knew I’d enjoy i.e. biographies, autobiographies, old favourite novels and so forth. I therefore had to find something else, and about 3 or 4 years ago I began to listen to thrillers of various sorts. I found I enjoyed them. Bring on that murder and gore! 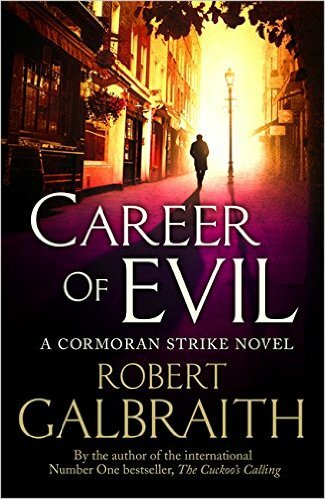 I know I enjoyed the second in the series too — The Silkworm — but I’ve just finished the third: Career of Evil. I listen to a lot of books (as I’ve mentioned…) but it’s quite some time since I found myself regretting the impending conclusion before I was even half way through the book. This was one of those occasions, though. I’d highly recommend this to anybody who doesn’t mind a bit of blood and guts, and relishes suspense and a tightly woven story that keeps you guessing right up to the end. Brilliant! This entry was posted on Thursday, November 12th, 2015 at 8:54 pm and is filed under Uncategorized. You can follow any responses to this entry through the RSS 2.0 feed. You can leave a response, or trackback from your own site.